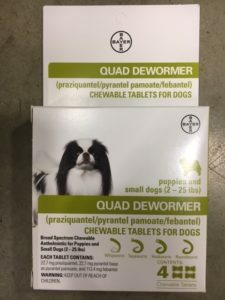 Quad dog dewormer is now available at Argyle Feed and Hardware. Dog dewormer s are essential in keeping your dog’s from parasites. With just one dose, Quad Dewormer’s chewable oral tablets is one of the easiest dewormer on the market. It can be given in small amounts in your dog’s food or given in your dog’s mouth directly. Below is the recommended dosage for each dog weights. Please consult your veterinarian before giving your pet a dewormer. It could have some serious side effects for sick dogs or small puppies. This entry was posted on Wednesday, April 19th, 2017 at 1:21 am	and is filed under articles, Dog, News & Updates. You can follow any responses to this entry through the RSS 2.0 feed. Both comments and pings are currently closed.